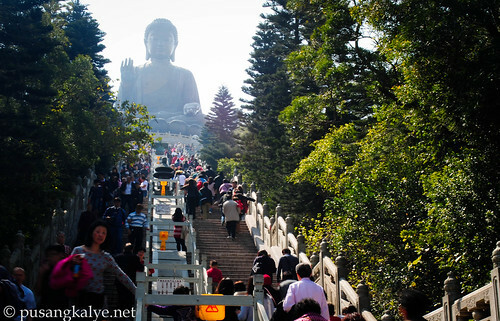 The BIG BUDDHA next to Po Lin Monastery and Ngong Pin Village in Lantau Island is another popular destination in Hong Kong . Although quite far from Victoria Harbor --the core commercial district of HK -- public transportation to and from this iconic Buddha statue is efficient even during peak season like Chinese New Year when large number of mainland Chinese tourists flood Hong Kong. The Buddha statue faces north towards Mainland China. It sits 26.4 metres atop a lotus throne and is 34 metres high, including the base. The status cost HK$60 million. 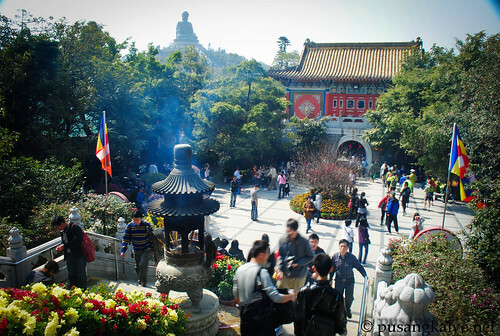 Po Lin Monastery is one of Hong Kong’s most important Buddhist sanctums and has been dubbed ‘the Buddhist World in the South’. Home to many a devout monk, this monastery is rich with colourful manifestations of Buddhist iconography and its pleasant garden is alive with birdsong and flowery scents. then take Ngong Ping Cable Car, which takes around 25 minutes. Walk for around 10 minutes to the Monastery. then take New Lantao Bus 23 from Tung Chung Town Centre, which takes around 45 minutes. then take New Lantao Bus 2 to Ngong Ping Village. Travel takes around 40 minutes. We came from Cheung Chau where we stayed with our godmother for two nights in Hong Kong so we took the ferry from Cheung Chau to Mui Wo. (Similar to Option #3 in the above list). 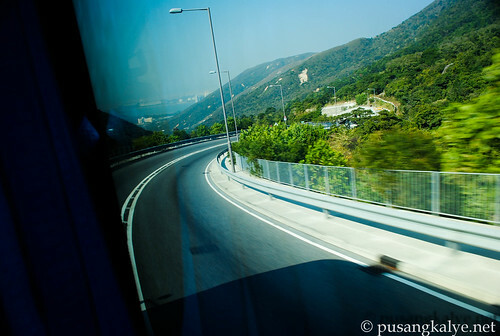 We then took the bus from there to Ngong Ping Village. It was mostly an uphill ride for 40 minutes. Approximate fare is $HK 27. That's roughly Php 135. 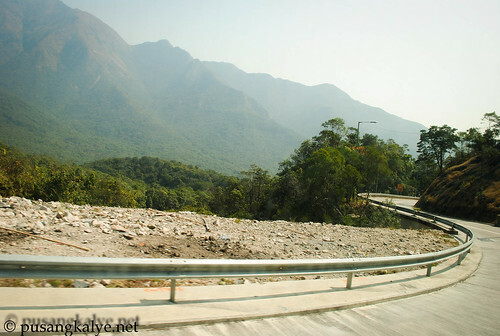 The route passes through an area of mostly protected forest. This is the virgin side of Hong Kong stripped with all the condos and high rise office building. The area is mostly vegetation and on the horizon is the open sea. We stayed in the complex for almost two hours after which we boarded the bus to Tung Chung where we transferred to the adjacent train station and off we go to Cental Hong Kong. If you are planning a visit to the Giant Buddha, it would be better to include Disneyland in the itenerary as it lies between Central and Ngong Pin Village. Unfortunately for us, we were running out of cash at that time and the idea of having only half day left and thinking about the long lines we had tk deal with due to the Chinese New Year holiday, we decided to go to The Peak Tower instead. Hong Kong Disneyland will have to wait another day.